(v. 4) May he grant you your heart’s desire and fulfill all your plans. (v. 5) May we shout for joy over your victory, and in the name of our God set up our banners. May the Lord fulfill all your petitions. (v. 6) Now I know that the Lord will help his anointed; he will answer him from his holy heaven with mighty victories by his right hand. (v. 7) Some take pride in chariots, and some in horses, but our pride is in the name of the Lord our God. (v. 8) They will collapse and fall, but we shall rise and stand upright. (v. 9) Give victory to the king, O Lord; answer us when we call. Palm Sunday marks Jesus’ triumphal entry into Jerusalem as a humble king on a colt, on his way to death on a cross. As he enters, people spread their clothes on the road along with branches (traditionally depicted as palm branches) while shouting “Hosanna” or “save now.” Jesus’ entry can be viewed as the beginning of a victory march towards death and over death, which is why the people cried out “save” to him. Though Jesus is ultimately on his way to the cross, there is still a mood of celebration on Palm Sunday because there is a recognition that Jesus is “King Jesus” and, ultimately, he wins the victory, and he is the only who can save us. On Palm Sunday, many black churches focus their attention on salvation, or victory, through Jesus Christ; one may even hear “Ride on King Jesus, no man can a-hinder me” while palm branches are waved in the air. In A Tale of Two Cities, Charles Dickens writes, “It was the best of times; it was the worst of times.” Somehow, this captures the current state of the United States. Many are filled with joy because of the election of the first African American President, Barack Hussein Obama. There is hope on many fronts because of this—these are the best of times. Yet, this is the worst of times, too, because of the economic crisis, perhaps the worst since the Great Depression—people are drowning in the flood of foreclosures, loss of jobs, loss of retirement funds, loss of college funds for children, etc. Many are in a battle to survive and to just make ends meet. The government has bailed out some, but not most; and there are those who are looking to the government to save the country from this situation. But the government can’t really save. The government, presidents, kings and queens, need a savior, too. What Psalm 20 shows us is that God is the only one who can truly bail anyone of us out, because God is the only one who truly can save us in the midst of life’s battles. Human power, the chariots and horses of this day, cannot do it, only God can do it. Psalm 20 is known as one of the royal psalms (Psalms 2; 18; 20; 21; 45; 72; 89; 101; 110; 132; and 144:1-11), because it is about God’s designated king, the “anointed” one (v. 6), the one who represents divine rule and the kingdom of heaven on earth. It is obvious that the “king” (v. 9) is important in this Psalm and is, in fact, the one who is in trouble; otherwise, there would be no need to declare, “give victory to the king, O Lord” (v. 9). The king is in trouble, and this Psalm seeks God’s help for the ruling human king. The ruler is in trouble that may be immediate or in the future; thus, he needs divine intervention. He needs God to make a way out of no way. He needs God to straighten out the crooked things in his life. The Psalmist begins with “The Lord answer you in the day of trouble! The name of the God of Jacob protect you!” (v. 1) The king needs protection, “help” (v. 2), “support” (v. 2), divine answers (vv. 1, 6, 9), and ultimately, “victory” brought forth by God (vv. 5, 6, 9). Often in scripture, the king’s trouble is an impending war so Psalms such as this one would function as a prayer before the king and army go out to war or, possibly, at his time of enthronement, anticipating future wars. The war imagery is clear in this Psalm in its references to military objects -- “chariots” and “horses” (v. 7), setting up “banners” (v. 5; cf. Numbers 10:13-28) that represent a military unit, and in the cries for victory (vv. 5, 6, 9) in the battle. Some view this Psalm as a liturgical service before a battle, which is why there is talk of the “sanctuary,” “offerings,” “burnt sacrifices,” and “petitions” (vv. 2-5). The king is possibly in the temple to pray while offering ritual sacrifices (vv. 2-5). Then, there is an assurance of victory (vv. 6-8) which is followed by a closing summarizing prayer (v. 9). The faithful people of God are interceding for the praying king because they know their destiny is wrapped up in his destiny. His loss is their loss, and his victory is their victory. This is why they hope to “shout for joy” over his “victory” (v. 5) and declare that “we shall rise and stand upright” while the adversaries “collapse and fall” (v. 8). God’s people, including the king, pray because they are in great need, in dire trouble. They have to look to the heavenly hills from where their help comes; thus, they turn to the Lord in prayer. Rather than shooting, stabbing, and slandering others because of a war or the hurting in their lives, they pray to God, the only one who can help. They do not rely on themselves to fight, but they fight through prayer and realize that authentic and complete victory can only come from God. Victory does not come through violence, but through a grander and correct vision of who God is and what God can do. The king is important in this royal Psalm, but even more important is the Primary Mover—God. From the outset, the psalmist is full of faith in God, turning to the “Lord” and “the God of Jacob” for an answer and protection (v. 1). The psalmist would not even pray if there was not an initial trust in God. This God, who is worthy of trust, is the God of the covenant of whom Jacob said, “God answered me in the day of my distress and has been with me wherever I have gone” (Gen. 35:3). Thus, the psalmist recalls these words in verse one and knows that his God (the God of Jacob) will answer the king in the day of trouble just as the Lord did for Jacob. The Lord, who is a “rock” (metaphor of expression of trust in God) and “redeemer” in Psalm 19:14 and strong to save the king in Psalm 21, is shown to be the same type of God in Psalm 20. Despite trouble, God is definitely present to help and save. The psalmist demonstrates this with the threefold emphasis on the “name” of God (vv. 1, 5, 7). In the Hebraic tradition, the “name” signifies God’s presence, power, and character and suggests that the Lord is present on earth even though God is in the heavens (1 Kings 8:15-30; Psalms 44:5, 54:6, 118:10-12). The “name” is representative of the Lord (Psalm 54:1, 124:8) and God is not only present and powerful through the divine name, but is highly active. The psalmist is consumed with the action of God, who has a history of helping (e.g. the exodus from Egypt). Through most of the Psalm, God is the subject of the verbs. God is called upon to answer (vv. 1, 6, 9), protect (v. 1), send help (v. 2), give support (v. 2), remember offerings (v. 3), regard sacrifices (v. 3), grant desires (v. 4), fulfill plans and petitions (vv. 4, 5), and help his anointed (v. 6). The action and nature of God are amplified to magnify the One who truly brings victory to the people of God. God needs to act in order to bring a resolution to the problem; this is why the king and the people pray. In addition to the “name” of God being emphasized, the psalmist stresses the verb “answer” (vv. 1, 6, 9) three times in relation to God, for God is the One who must answer in order for help to come to the king. Furthermore, the writer stresses that God will “answer” with “victory” or “salvation” (the Hebrew word for salvation is the same as victory; “help” in verse 6 is also the same word). “Victory” or “salvation” (“help” in v. 6) is mentioned four times in relation to God’s work, suggesting that it is the Lord who will bring ultimate victory or salvation in the battle. 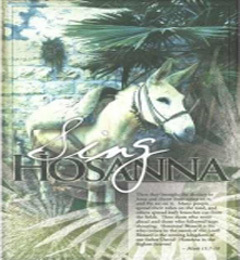 It is the Lord who saves which is why, when Jesus enters Jerusalem on a colt, the people cry out “Hosanna!” which literally means “save now!” (Mark 11:9). Only God can give victory or save because salvation is dependent on the heavenly King not earthly kings. “The king is not the savior but the saved. The saving victory will be God’s work.”1 Even the Hebrew translation of verse 9 suggests that the real King is the Lord for, in Hebrew, verse 9 may read, “give victory O Lord; let the King answer us when we call,” the “King” being the Lord. Human power is not the basis of trust for victory or salvation, but the ruling power of God is the basis. The psalmist makes sure the hearers know that Israel’s “pride is in the name of the Lord our God” though “some take pride in chariots, and some in horses” (v. 7), which represent the supreme weapons of military might in that day. “The psalms reiterate that trust in weapons is a contradiction to faith in the Lord.”2 See also, Psalms 33:16-19; 44:3, 6-7; 147:10-11; human resources, power, and prestige cannot save but God alone saves. Even the powerful on earth must rely on God for deliverance because battles belong to God (Deut. 20:1; 2 Kings. 6:17; Isaiah 31:3 and 37:23-36). In other words, “the Lord reigns” (Psalms 47, 93, 95-99). Only the power of God can bring growth, salvation, and victory. Because the Lord reigns, the anointed King of kings, Jesus Christ, the one who died and rose for all, has defeated the powers of death forever. God has given the ultimate victory to our King, Jesus Christ, causing us to say in the vein of the psalmist, not that salvation belongs to us, but “Salvation belongs to the Lord” (Psalm 3:8). The Lord reigns! In times of trouble, we can take pride in the name of the Lord our God because God will save us and give us victory in our battles. Nothing is too hard for our God. The Lord reigns. We won’t collapse and fall but rise and stand upright (v. 8). We have no need to trust in chariots and horses and our own might. Salvation belongs to our God. Thanks be to God who gives us the victory through Jesus Christ our Lord. The Lord reigns! Hosanna, God will save now! Smells: The odor of burnt sacrifices. Utilize Yolanda Adams’ song “Victory” to help bring home the point that we have victory in Jesus. 1. Mays, James. Psalms Interpretation, a Bible Commentary for Teaching and Preaching. Louisville, KY: Westminster John Knox Press, 1994. p.101.